This RHS Award winner is a compact shrub which is ideal for hedging as it flowers freely and repeats well. 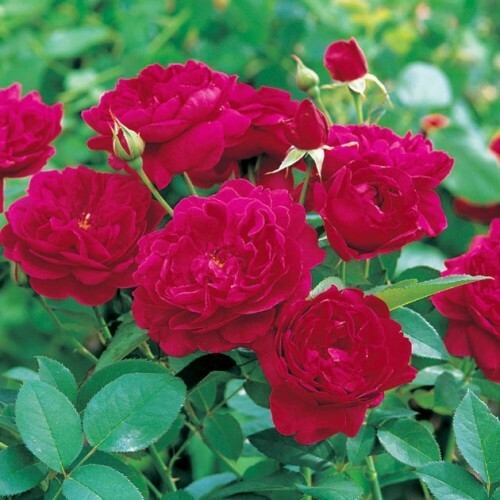 Darcey Bussell's beautiful, deep crimson rosettes give off a delightful fruity fragrance. We're very proud to have our David Austin English Roses are imported directly from their growing facilities in the United States. Mr David C.H. Austin is a world-renowned rose breeder and writer who lives in Shropshire, England. His emphasis is on breeding roses with the character and fragrance of Old Garden Roses but with the repeat-flowering ability and the wide colour range of modern roses like Hybrid Teas and Floribundas. Since its founding in 1969, he and his firm David Austin Roses in Albrighton, near Wolverhampton have introduced over 190 rose cultivars. Cultivars have been named in honour of his family, well-known rosarians, geographical landmarks in Britain, historical events, and British writers, particularly Shakespeare and Chaucer, and their works or characters. In 2003, David Austin was awarded the Victoria Medal of Honour by the Royal Horticultural Society for his services to horticulture and the Dean Hole Medal from the Royal National Rose Society.